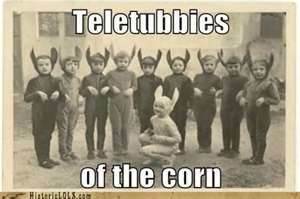 How many of you are familiar with the Tele Tubbies? Though it would be a hard call, I think I would take a day of Barney over a day of Tele Tubbies but either would require Xanax and ear plugs. 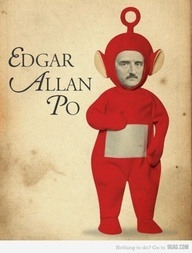 There are four Tubbies. 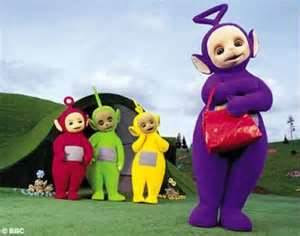 Two boys, Po who is red and Tinky Winky who is purple and two girls, Laa Laa who is yellow and Dipsy who is green. A slight pause here while I ask, who is the lucky person that gets to determine gender for a Tubby? Thank God for the sharp eyes of our friend Mr. Jerry Falwell! He was right on top of the situation and issued an imperative warning to the naïve parents of America about that degenerate Tinky Winky. "He is purple — the gay-pride color, and his antenna is shaped like a triangle — the gay pride symbol." And, if that isn’t enough evidence, the little pervert carries a purse! 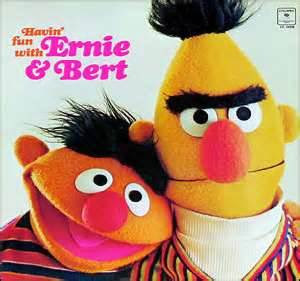 Now when is someone going to do something about Bert and Ernie? Better still, yank that pink-o commie channel right off the air. I’ll bet Mr. Falwell has an alternative broadcast system in mind.